This morning, just a few hours ago, I landed in the United States after an overnight flight from Buenos Aires to Washington, D.C., and a quick hop here to Philadelphia. It will take me a few days to collate my notes, edit my videos, and start formulating a plan of attack to report on everything I tasted. For now, however, I will say that, if you have the chance and the time, a visit to Argentina is a must--it's one of the most beautiful, hospitable places I've visited. And even if you don't, make sure to keep on exploring the country's wines. 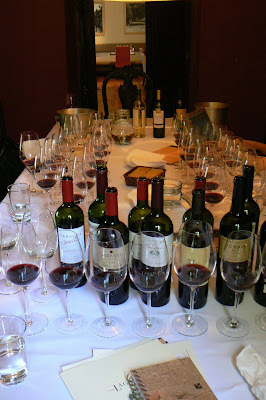 They are without question some of the most enjoyable and exciting in the world right now, and from familiar favorites like Malbec and Torrontes to less-well-known bottlings of Tempranillo, Cabernet Sauvignon, and more, there is a limitless range of wines to learn and love. I took the photo above while visiting excellent Mendoza producer Dona Paula, and the one below in our tasting room at Lagarde. It was hard work, but the very best--and most rewarding--kind of hard work. I miss it already.